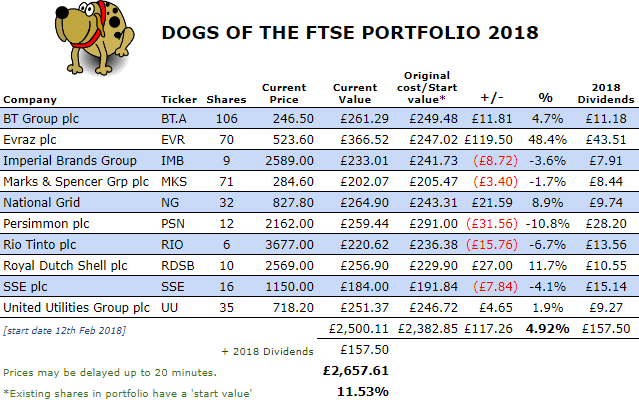 It’s been around 9 months since I set up my 2018 experimental Dogs of the FTSE portfolio, so time for another update. With the markets recently in ‘chaos’ and ‘turmoil’, what happened to my poor little flea-bitten canines? As at close of trading on 19th October 2018, the portfolio was showing a 4.92% gain from its starting value. Including dividends received, it’s a 11.53% gain. Over the same period, the FTSE 100 Total Return was 0.34% so the Dogs weathered the recent rocky patch and came out of the other side more or less intact! Ok, so half of the stocks are in the negative but these are cancelled out by the other ones which are positive, so I’m not too concerned. That’s a great result Weenie! The october effect (chaos and turmoil) has little effect on your ‘poor little flea-bitten canines’ it seems. I will purchase few poor little canines myself soon. My giant healthy company stock is in wild weather at the moment (more about that in my next portfolio update). But I stay the course. Thanks Marc – note that this is just an experimental portfolio and not what I practice with the larger part of my portfolio! Wow, I’m impressed with their performance -they have done really well compared to the market. A cool fun portfolio to play with. Yes, I’m surprised at the performance as I’d expected to see red numbers all round! This is a cool experiment! I’d definitely be tempted to do something similar in the future; investing passively via Vanguard may be effective, but it’s not as fun as this. How do you track it all? In an Excel spreadsheet? The experiment serves two purposes – it allows me to have a bit of fun without risking the main part of my portfolio and I still get dividends from the stocks which I reinvest in the main part of my portfolio. I keep debating about buying individual shares but not brave enough yet. I have some I have my eye on (games workshop being one) and may take the plunge. That’s a bit of a turnaround for you FBA – I thought you were anti-property…? I Still think you’re not going to get much capital growth but thats not why you invest Is it. Its the long term passive income I’m interested in. I Probably won’t make anything to begin with. It won’t be anytime soon but I’m reading all I can as I do with anything to try and decide if it sstacks up. Note that this is only an experimental portfolio so there’s higher risk in individual stocks. I’ve always been a fan of Games Workshop (used to paint the models and my sis used to work in their HQ) but never invested – I think the price peaked recently but might be a good time to get in with a lower price. Interesting that you mention going into property but investing oop north on a small property could get you decent yield, though slower capital gains. I live oop North and have 3 nicely terraced properties that I let. Touch wood, never had a problem with them. I decorate them to a nice standard could have let them out 10 times over. Paid approximately £100 K for each one, have fixed -rate interest only mortgages on them and although only in my second year of having them pleased with my investment. I used an online letting agency that advertised on Rightmove/Zoopla and did all the credit checks for me. Interesting results, Weenie. Are you factoring in dealing (buying /selling) costs too? There’s quite a lot of variability in that overall 4.9% gain; as the saying goes “never cross a river if it is on average only four feet deep” meaning beware of statistic (they have a nasty habit of smoothing over the cliff-edge effects, in this case, the potential for going bankrupt)! Buying costs have been factored in but not selling costs because the strategy dictates that stocks are only sold after 12 months and if they are no longer in the top high yielders in the FTSE100. Right now, if things stay the same, 4 of them will be sold in early Feb, to be replaced by 4 new ‘dogs’, so that’s 4 x selling costs, but that could change when the time comes. Yes, there is a lot of variability there – perhaps that shows diversity? I don’t know. Thanks for sharing your experience with renting out properties oop North, although house prices will be rising in our area so you will see some uplift there. With decent rental yields, using an agency to do all the credit checks etc means less hassle and no real hit on the profits. Hope you continue to have trouble free lettings!